During my PhD research, I investigated the possibility to influence the crystallization behavior of glycine by means of crystallization experiments under ambient conditions. I could show that it is possible to control the crystal formation of glycine from aqueous solution by isotopic exchange (H/D-exchange) on the solvent or the addition of mineral powder. Glycine, the smallest amino acid, can crystallize from aqueous solution in different stable solid forms that are called α and γ polymorphs. I could show, on a statistical basis, that glycine forms the γ polymorph from heavy water (D2O) solutions instead of the α form, which is known to crystallize from normal water (H2O). Additionally, my studies regarding the introduction of inorganic powdered material, like fluorapatite (Ca5[F(PO4)3]) or calcite (CaCO3), into the crystallization system, also lead to γ formation. 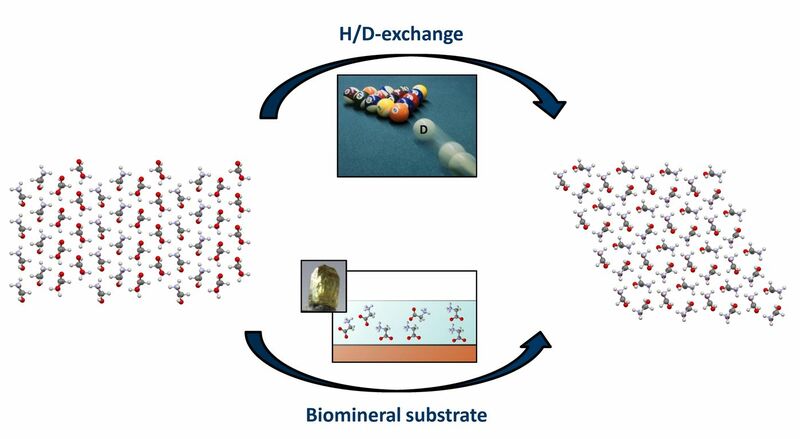 That is, our studies showed that the H/D exchange as well as the introduction of inorganic surfaces to the crystallization system influence and even regulate the crystallization behavior of glycine immensely. The scheme illustrates that either deuteration of the molecule (top) or the application of biominerals (bottom) can lead to crystallization of γ-glycine (right) instead of α-glycine (left) from solution. As methods the experimental grazing-incidence X-Ray diffraction (GIXRD) investigations accompanied by force field simulations were carried out to describe the interface between the amino acid solution and the biomineral surface structure. The support by computational methods offered an insight into the molecular interaction level and thereby provided nice approaches to explain the observed phenomena. The video shows force field based molecular dynamic simulations regarding the dissolution of an interacting glycine dimer in aqueous environment of H2O and D2O molecules. Further, it shows the crystallization of glycine from a water solution droplet on fluorapatite (100) surface and calcite (101) surface. 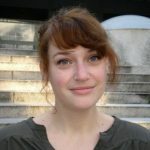 Dr. Anna Kupka has recently accomplished her PhD research in the department of Inorganic Chemistry I at Ruhr-University Bochum, as a stipend holder from Graduate School of Solvation Science, GSS, RESOLV. She has had research stays in various scientific institutions in Spain, Italy and France including her GSS internship in Spain, and has attended several conferences. 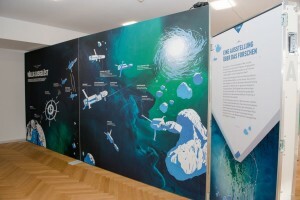 Read more about our public science exhibition!